Don Dow, CEO and owner of Artograph, celebrated his 39th anniversary with the company this month and looks forward to soon beginning his 5th decade in the art materials world. Coming into Artograph, a maker of tools for artists since 1947, Don brought a strong sense of advocacy for art education, having been a high school art teacher. This connection to art education remains with Artograph to this day as the company frequently donates art materials to schools and art education programs. This support has gone to programs as diverse as a veterans’ art center in Colorado, to a program in Oklahoma to which Artograph donated a large quantity of light boxes for use in art therapy for the elderly to aid in fighting memory loss, and a charity arts center in southern California. Recently, a struggling rural school in North Carolina received a donation of Artograph products to support their efforts to revive their art classes. Their teacher said the students were unused to having new, high quality art materials to work with and were thrilled with the tools Artograph sent. Before opening our store in 2015, I spent 40 years of my life directing community arts centers. Prior to that, I taught college level art for six years. But it was during my arts center years that I advocated for all of the arts for all of the people. I developed the Wayne Center for the Arts in Wooster, OH 1979-1991. From 1991-2015, I was founding executive director of the Fitton Center for Creative Arts here in Hamilton, OH. It was during those many years that I worked with city councils, mayors, state elected officials, community leaders, school boards, and others to convince them that the arts matter in people’s lives. I was able, over time, to convince decision makers that investment in the arts was an investment in the quality of life of the community. My evidence was how the arts improved the performance of students in the public schools (backed by our own empirical research); impact on economic development; achievement of goals for under-served populations; and how the arts helped to improve social inequities. Advocacy never ends, so when I retired to open Renaissance, I still advocate for the arts, but now more for the visual arts. I am most comfortable here since I have a Master’s degree in painting from the Maryland Institute College of Art. When I speak to groups, I always point out how the arts have the power to improve communities and bring meaning to people’s lives. Marabu was proud to be one of the sponsors for Empty Bowls - Detroit, an annual event that raises funds and awareness for families in need of food, housing, health services and job programs. Marabu provided a large shipment of paint for their community bowl-painting workshops. The painted ceramic bowls are then sold at the event. Details at The Empty Bowls Project was founded in 1990 when Michigan art teacher John Hartom, and wife Lisa Blackburn, challenged his high school art students to make 120 ceramic bowls and a personal difference. Hartom's students accepted the challenge and made enough bowls for the entire school staff to use as serving pieces for soup at the school fundraiser. Guests were given basic information about hunger and, to their surprise, were asked to keep their bowls as a reminder of all the empty bowls in the world. The reaction of the staff was telling. Hartom and Blackburn realized something very powerful had occurred. What was to be a one-time luncheon became an international grassroots effort to help fight hunger, thus starting he Empty Bowls Project. Empty Bowls Detroit began in 2007 with a youth group that painted 100 bowls and raised $500. In 2017, 11 years since we began, Empty Bowls Detroit attracted more than 600 attendees and raised more than $35,000 for CCSS. None of this would be possible without our generous volunteers, donors and sponsors. All ‘personnel’ are unpaid volunteers and we are proud to declare that 100% of all net proceeds are passed on to CCSS to feed those in need. Often joined by artisans, craftspeople, churches, schools, and youth groups, independent Empty Bowls events across the U.S. and Canada have raised millions of dollars in the fight against hunger. Regardless of the location, sponsors, and the bowls used, all events include a simple meal and a bowl to take home to remind us that someone's bowl is always empty. Hot Wire Foam Factory was recently approached by artist Cory Hunt who was working with a non-profit organization called The Magic Wheelchair. Cory had a project to do and needed to get it done fast! Foam was his medium of choice and How Wire jumped at the chance to help in his quest. In 3 short weeks, their new found artist friend created a Fortress of Solitude Super Girl costume for a little girl named Zoe (pictured below). From the good people at Hot Wire Foam Factory - "Our story is short in that we were able to participate from a distance by donating a kit, but it made us proud to know we could help in a small way to make a big difference. This tool kit will go on to make many other projects. We hope this story encourages others to be open to saying YES and making magical moments for people you may never even meet." Over the past ten years, San Francisco's real estate market has been fueled by the tech industry, driving many artists and arts organizations, including dozens of galleries, out of the city or out of business. Realizing that there was a dearth of exhibit space in San Francisco for photographers, Pina Zangaro converted two large spaces in the front of their building for use as a photo gallery. They host five or six large exhibitions a year, all at no cost to the exhibitors, in addition to many smaller arts events. In a city that lacks exhibition space, the Pina Zangaro Gallery has become an important resource for photographers at all levels. Additionally, the Gallery has been a great tool for better connecting with the users of our print presentation products. Through April 19th, The Gallery is hosting a reception for First Exposures, a youth mentoring program for under-served youth in the Bay Area that provides a creative outlet for students to express themselves in a safe and supportive environment and encourage them to become articulate, confident, and responsible young adults. Participation in the program is voluntary, and students commit to attend class once a week, each Saturday, for at least one academic semester. Mentors come from an array of photographic backgrounds, but all come to the program with a commitment and dedication to arts mentoring. Dixon Ticonderoga Company and The Kids In Need Foundation have worked together to ensure success in the classroom for over a decade. 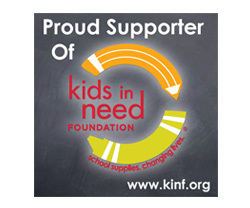 There are 40 KINF Resource Center locations in the United States, distributing much needed school supplies to kids who would otherwise go without. This year Dixon has donated 70,000 in fine art supplies, which will be distributed to the Resource Centers, and is working with 10 KINF Resource Centers are working with ten local artists to create 20 fine art pieces using products from the Maimeri, Canson, and Daler-Rowney brands. Ten masterpieces will be auctioned off at the national KINF annual gala and 10 pieces of art will be auctioned off at the local level to raise money for local Resource Centers. Dixon also donates up to $1,500,000 in products annually to KINF Resource Centers. Early in July, Marianne Bennett, owner of MM Manufacturing aka Marvelous Marianne's received this email from a rural Title 1 school. "I would like to request a donation of your product for our school's art program. We are a small, rural, Title I school who does not have a large budget for purchasing items from year to year, therefore we rely heavily on donations. Our art room does not have a sink and in order for students to clean up, they must walk to the nearest student bathrooms which are a considerable distance away and make it difficult for me to monitor the classroom and the bathroom simultaneously as the two rooms are out of sight of one another. Since this is a gentle cleaner that can be used without water, it would be a very welcome and appreciated addition to our room." Marianne said, "All of us, suppliers, retailers and reps donate items but this email for a rural Title 1 school in Rural may be reminder to all of us of the importance of our art giving."